Grow your architect skills and expertise in the area of Identity and Access Management. This Trailmix has been curated just for you! Review all the info you need to know for the Identity Access and Management exam. Learn how Salesforce authenticates users who are trying to access Salesforce content via the OAuth standard. Get an overview of how to better manage login and authentication for your org in several key ways. Learn about identity and external identity licenses and where they can be used. Enable users to log into a Salesforce organization using login credentials from an external service provider, such as Facebook or Janrain. 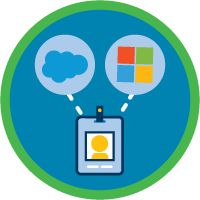 Explore how to use external ‘authentication providers’ to give access to Salesforce portals and orgs. Get an overview of how Force.com uses a combination of OAuth and SAML functionality to provide seamless SSO facilities for applications. Learn how the Force.com platform allows mobile applications to authenticate into Salesforce seamlessly using SSO. Learn how to set up and customize communities to meet your business needs. Learn about the two OAuth options that are supported by Canvas. Learn the basic mechanics for provisioning a community user including the different techniques available. Learn how to set up Active Directory integration with Salesforce Identity Connect. Understand how Just-in-Time provisioning uses a SAML assertion to create regular and portal users on the fly at first log in. Learn more about connected apps and how they connect to Salesforce.com through identity and data APIs. Learn how to use a connected app as an authentication provider. Learn about the benefits of SSO and the best practices for configuring and implementing it. Explore the scope parameter and how it allows for fine-tuning of the permissions associated with the tokens being requested. Get an overview of Single Sign-On with Force.com including the benefits, best practices, sample implementations, and FAQs. Learn how to use OpenID Connect to link Salesforce or Community Identity with a Social Identity, such as Google+. Watch a demo of the App Launcher, a Social SSO portal for end users, which provides access to Salesforce apps and Connected apps. Discover how to use Salesforce as the identity provider to host a Canvas app in one organization. Learn how SAML SSO enables automatic authentication into your Canvas app. Learn how to leverage SSO technologies with Force.com Canvas. Follow this set of best practices when implementing delegated and federated authentication and SSO for portals and sites. Get an in-depth look at the OAuth 2.0 protocol in the context of Force.com. Learn how to simplify the end-user experience in multi-org deployments. Learn the SSO issues that can arise for developers integrating with Force.com and the steps to take to secure applications. Learn how session security can be used to limit exposure to a network when a user leaves the computer unattended while still logged in. Learn to configure a single sign-on experience from a Microsoft environment to Force.com without a third-party federation product. Learn how to use Login Flows to completely customize your login experience and more. Learn how administrators can enhance security by requiring a second level of authentication on login, known as Two-Factor Authentication.